The Waag, meaning “weigh house,” is a building that was constructed during the 1400’s in Amsterdam. It is located in Nieuwmarkt Square. This structure was initially a section of the walls of Amsterdam and was a city gate controlling access in and out of the area. The walls of Amsterdam were originally built during the middle ages for defensive purposes. At one time it was used as an anatomical theatre, that is, a laboratory of sorts used for the study of the human body. Over the years it has also been home to a fire station, museum and guildhall. Guildhalls were popular in earlier times when they were utilized by workers within a specific field as meeting places. 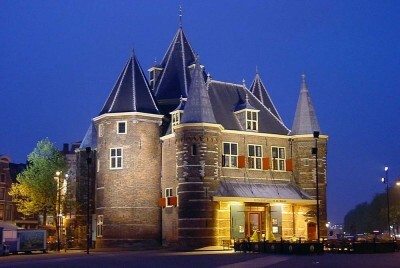 With the exception of places of worship, the Waag is the oldest surviving building in Amsterdam. It was deemed a Netherlands Heritage site in 1970 and is acknowledged by the Dutch Ministry of Education, Culture and Science. This designation called a “Rijksmonument” is reserved for places in excess of a half century old and having historical significance. A painting by Rembrandt in 1632 titled The Anatomy Lesson of Dr. Nicolaes Tulp contains a depiction of the Waag. The art work was commissioned by surgeons who at the time were using the building as an aforementioned guildhall. The Waag’s appearance is of an unmistakable Dutch design. As you approach the red and brown brick entrance you will view four steeple-like appointments. There are a few gabled windows showing on the front and sides, with a trio of more traditional window openings above the entry way. Round towers adorn both sides in front of the otherwise square edifice. Another larger circular tower is attached to the side of the building as well. An awning was added during a restoration which now provides protection from the elements. A gable stone proclaims the first stone of the structure was set in 1488. At its inception the Waag was a gate in the city wall named “St. Anthony’s Gate.” While the gate itself is believed to have been erected in 1488, the old weigh house has probably been in existence since around 1425. By the early 1600’s the city gate aspect of the Waag had lost its usefulness as a military defensive barrier. Therefore, in 1614, it was decided to cover both canals bordering the building and open the Nieuwmarkt square. During the 19th and 20th centuries the space was used for a variety of purposes including different types of workshops and even a fencing hall. From 1800 to 1850 public executions were held outdoors in front of the building using a guillotine to carry out the death sentences. The Waag was totally vacant from 1989-1994. After a complete restoration was completed, supervised by Walter Kramer, this attraction was opened to the public in 1996. Kramer was renowned for his knowledge of medieval design so many of the structures original detail was retained. Today, the Waag Society occupies the upper floors of the building. The Waag Society is dedicated to the advancement of culture, art and technology. The foundation holds regular seminars and presents exhibits in a variety of those fields. The main floor has been converted to a café and restaurant decorated in a castle-like fashion. You may want to begin your day there with a cup of coffee or enjoy a quick lunch. At dinnertime the space glows from the light of over 300 candles and elegant candelabras. There are several other tourist attractions within a half mile of the Waag including Rembrandt Square, the Royal Palace and Oude Kerk, the oldest church in Amsterdam.